The CEO of Boeing said the company is ‘humbled and learning’ following two horrific plane crashes that have killed more than 300 people in the last five months. Dennis Muilenburg wrote an open letter to Ethiopian Airlines after a Boeing 737 Max flown by the airline carrier crashed earlier this month, killing 157 people. The letter comes as questions continue to mount over the technology that caused the Boeing planes used by Ethiopian Airlines and Lion Air to go down. Muilenburg used the bulk of his letter to praise Ethiopian Airlines, which he said ‘represents the pride and progress of a great people and a symbol of The New Spirit of Africa’. ‘As the airline’s Group CEO Ato Tewolde GebreMariam said in his heartfelt statement yesterday, this tragedy does not define Ethiopian,’ Muilenburg wrote. Muilenburg then spoke of the ‘unimaginable pain’ that everyone involved with the Ethiopian Airlines Flight 302 accident has had to endure. Muilenburg spoke of the ‘proud history’ of Ethiopian Airlines, calling it a ‘pioneer and a leader’ in the aviation industry that launched ‘Africa into the jet age’ and connected the continent ‘with all corners of the globe’. The CEO also promised that Boeing was ‘working tirelessly to understand what happened and do everything possible to ensure it doesn’t happen again’. ‘All of us thank Ethiopian Airlines for their commitment and share their resolve to doing everything possible to build an even safer air travel system,’ he added. 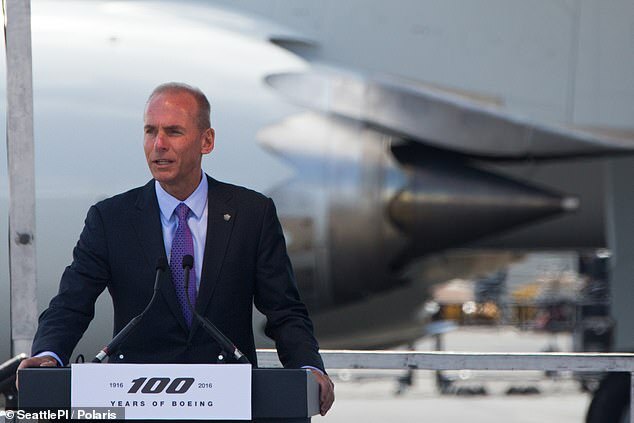 Muilenburg and the American aircraft manufacturing company will have its work cut out for them after a report revealed that pilots had less than 40 seconds to correct a fault with Boeing’s automated system that investigators believe led to both crashes. The pilots underwent a crisis simulation test to recreate the final moments of Lion Air Flight 610, which nosedived into the Java Sea in Indonesia shortly after take off in October 2018. 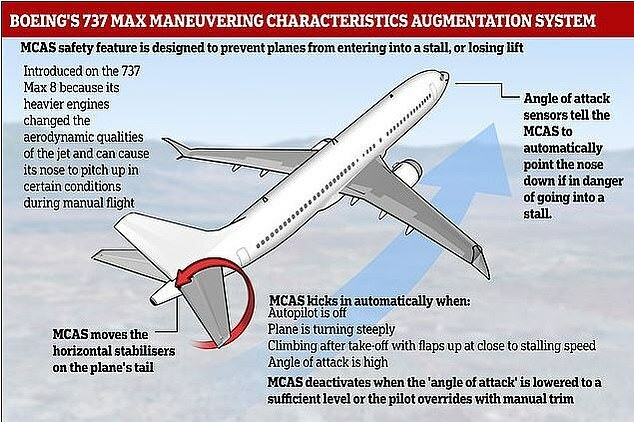 The Maneuvering Characteristics Augmentation System, known as MCAS, is also the focal point of the probe into the Ethiopian Airlines crash involving the same Boeing 737 Max model. The means of disengaging the system as described by the Times are complex. Pilots can reverse the anti-stall system by flicking a switch, but this would only delay a potential crash by several minutes. In order to fully avoid disaster, pilots would need to activate two further switches, cutting off electricity to the motor pushing the plane’s nose downwards, and also cranking a wheel to correct the resulting problems. John Cox, an Aviation safety consultant and former 737 pilot, told the Times that although pilots would likely trigger the first switch to extend the 40-second window, this would only buy several more minutes. In fact, the pilots and crew of the Lion Air flight were not even aware of the system. The captain reportedly consulted a technical manual in the jet’s final airborne moments. Following that first disaster, American pilots met with Boeing executives in Texas and demanded to know why the manufacturer had not told them about the new software. The software fix will prevent repeated operation of the anti-stall system at the center of safety concerns, and deactivate it if one sensor appears to have failed, two people familiar with pilot briefings told Reuters on Monday. The 737 MAX is Boeing’s best-selling plane, with orders worth more than $500billion at list prices. Within less than a week after the Ethiopian crash, the jets were grounded globally. Ethiopian and French investigators have pointed to ‘clear similarities’ between the two crashes, putting pressure on Boeing and US regulators to come up with an adequate fix. Aviation expert expects multiple factors in Boeing 737 crash. Tags: Addis Abeba city, Addisu Arega Kitesa, ethiopia, ethnic politics, Lemma Megerssa, Oromiya Regional State, Whose Addis Abeba? Ethiopia is a success story. But hatred of its native Tigrayans is causing some to think nervously of Rwanda. By James Jeffrey is a freelance journalist who splits his time between the Horn of Africa, the U.S., and the UK, and writes for various international media. Follow him on Twitter @jrfjeffrey. “Abiy would do himself good to acknowledge this as a Herculean task. Even then, doing so could be a thankless job in a nation where constituents have widely varying and more so conflicting priorities and interests. His analogy of the state with a room that has been accumulating rubbish is not far removed from the historical processes that gave way to a country without strong institutions, democratic culture, shared values and accountable power. Informed by the past and steered by grievances, the public would have hardly any reason to develop an interest in the fancy projects of scene and decoration. Many want to see their leader focus more on optimum gains from the transition that will help the nation move to a peaceful, orderly and just future. With a lack of clarity of purpose, confusion and unpredictability in the driver’s seat, there is much more appetite to see a series of political reforms, despite their significant consequences for the slow, methodical building of institutions. Talk that Prime Minister Abiy Ahmed (PhD) will let the nouveau riche in the country spend five million Birr for a ticket to sit at a dinner in his company grabbed international headlines last week. But the irony was not lost on many Ethiopians who are struggling to make ends meet. If they see cynicism in the whole affair, they should not be blamed. The funds were raised to finance a project for the rehabilitation of Addis Abeba’s river banks, estimated to cost one billion dollars. What would cost a businessman in search of patronage from the power that be can build no less than 30 water wells for desperate citizens in rural Ethiopia, if not three well-equipped clinics? From renovating his office to restoring the grounds of Menelik II Palace, Abiy appears to be excited with matters that have more of a symbolic value. His attention and energy seem to be spent in mobilising funds from members of the public here and in the diaspora, giving the impression that he may end up forming a “Go-Fund-Me Administration”. The irony is that he reigns over a country that has far too many essential needs to sustain life and a government with as many crises to handle. Discourses and debates around politically hot-button issues abound. Citizens should continue to voice their concerns. It is only characteristic of individuals’ rights to demand change and answers from the government and their representatives. The public’s emotionally-rooted political activism should serve as fuel in the practice of constituent politics, but parties should find the courage to exercise forbearance as does Abiy’s administration. Meeting such demands requires a sober, fair and quantitative implementation that can only be provided by independent democratic institutions and diverse legislative bodies. The nation’s elites across the many divides have their work cut out for them. The most critical piece of task on the table is rebuilding the institutions into ones that the public can trust. It is a task that has already begun even if the input from opposition parties leaves a lot to be desired. The heaviest burden lies on Abiy`s administration, which possesses the de facto transitional mandate. It has the duty to focus its resources and attention on institutionalising power to realise a legitimate election, ensure law and order and reverse the macroeconomic slowdown that will have consequences in the political realm. Association for Human Rights in Ethiopia (AHRE) pens this letter to express its concern following the demolition and planned demolition of thousands of houses in Legetafo town which left families on the street. This comes as a shock to AHRE which has warmly welcomed the overall reforms in Ethiopia, despite some pressing challenges. AHRE has published numerous statements concerning forced displacements and other human rights concerns that recurred in the country and intensified to a larger scale in the past couple of years. The mass eviction against thousands of families is being conducted by officials themselves, unlike intercommunal conflicts and displacement in the rest of the country which involved the communities themselves, albeit reports of lower level of officials’ involvement. 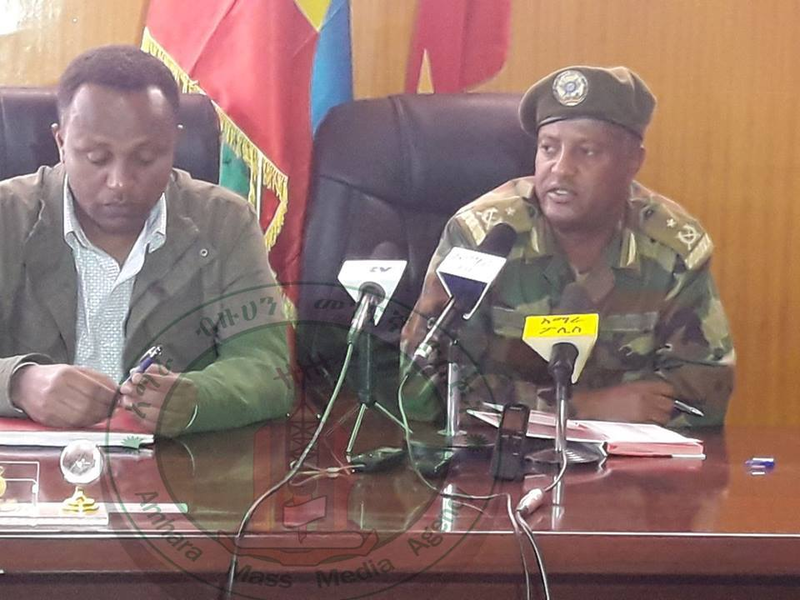 AHRE has learned that the town was established in 2008 as a new special Zone along with seven other towns as part of the then Oromo People Democratic Organisation (OPDP) plan to curb the expansion of Addis Ababa to its outskirts. Against the local authorities’ claim that the houses were built violating the town’s master plan, several evicted families have bought the plots of land and built the homes before 2008. Many of them also say they have been paying hundreds of thousands in local currency to the town administration for utilities including electric and water bill, and other land payment fees. Those evicted include children, mothers, new born infants, the elderly, and the handicapped. This is all the more disappointing when evictees were given a short notice (7 days) with no other options of a possible substitute residence. Dear honourable Prime Minister Abiy, AHRE has in different occasions warmly welcomed and commended the incredible positive steps your admiration took towards bringing peace with Eritrea; releasing political prisoners; opening up the political space etc. Ethiopia is signatory to The International Covenant on Economic, Social and Cultural Rights (ICESCR). The right to adequate housing mandated by the UN defines forced eviction as “the permanent or temporary removal against the will of individuals, families and/or communities from the homes and/or land which they occupy, without the provision of and access to appropriate forms of legal or other protection.” Thus, the measure is in clear violation of the right to housing which Ethiopia is signatory to. We kindly urge your good office and your administration to issue an order to local authorities to immediately stop mass demolition and evictions; and compensate those families whose houses were demolished.